In this thoughtful debut children’s book by a veteran educator, a first-grader with difficulty relating to others embarks on a “friendship journey” and socially blossoms with help from caring adults. Six-year-old Zander, happily home-schooled by his grandmother, had never been to school with other children, but he’s looking forward to attending his neighborhood elementary school. Only days after joining the Terrific Tadpoles class, grades 1 and 2, Zander comes home upset, convinced that his teachers, Mrs. Perez and Miss Rivers, are unhappy with him. “Their mouths look frowny and sad” when they watch him sometimes, Zander tells Miss Joy, a family friend. Even Zander’s grandmother seems unhappy lately, he thinks. (Adults will understand that Zander lives with his grandparents and that Zander’s teachers have talked to his “Nana” about their concerns.) Miss Joy gently elicits the fact that Zander doesn’t smile or say hello to teachers at school, and she helps him practice friendly greetings and making eye contact. Zander is embarking on a “friendship journey,” she says: “Are you ready to do some greeting, smiling, and eyeball-locking next week at school?” Zander gives it a try, and although his first smile is “crooked and wobbly,” he finds that making his teachers happy makes him happy, too, so much so that he’s brave enough to use his new social skill to gain his new friend, Emmy Lee. He stumbles a bit due to his anxiety over anything new—“For Zander, the word ‘new’ could mean a fun adventure or a scary experience”—as well as his trying to grasp the concepts of sharing and casual, getting-to-know-you conversation. 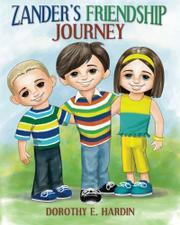 But Miss Joy reminds Zander that a friendship journey can be tricky, and he perseveres, soon discovering that sharing, taking turns and talking with friends can be fun. Hardin’s appealing, carefully crafted book, written for “children, family members, and school-based professionals,” will resonate with young readers facing similar challenges and with the adults helping them. The book’s uncredited illustrations, however, while serviceable, are flawed by the lifelessness of the children’s oversized, downturned eyes. A useful, compassionate debut that offers astute guidance for fitting in.